This cilantro lime chicken is easy to make and packed with flavor! 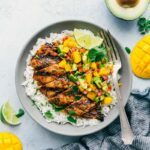 While the cilantro lime chicken can stand on its own, I’ve included accompanying recipes for a cilantro lime rice base and a delicious mango avocado salsa. This transforms this cilantro lime chicken into a tasty and healthy meal that is sure to be a hit. 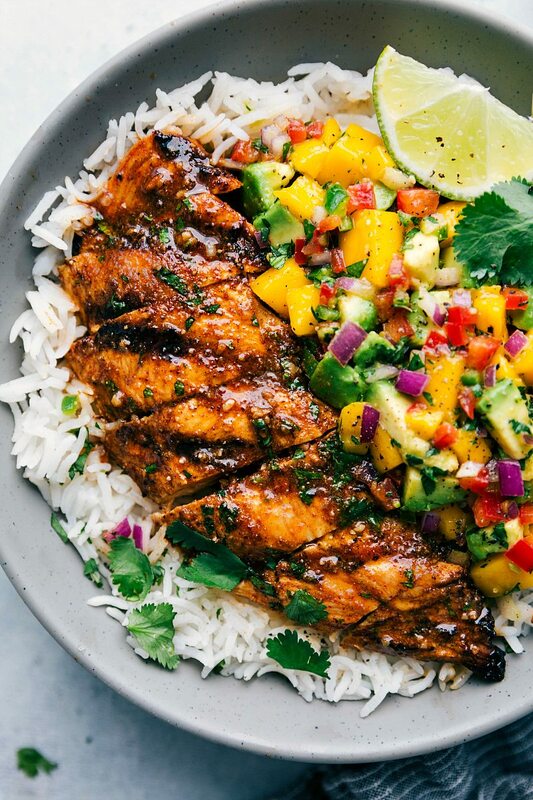 If you don’t like mango salsa, pair this cilantro lime chicken alongside a panzanella salad, cucumber salad, or a corn salsa. The marinade for this cilantro lime chicken is everything a good marinade should be: it’s easy to whip together, has so much flavor, and doesn’t contain any “crazy” ingredients. 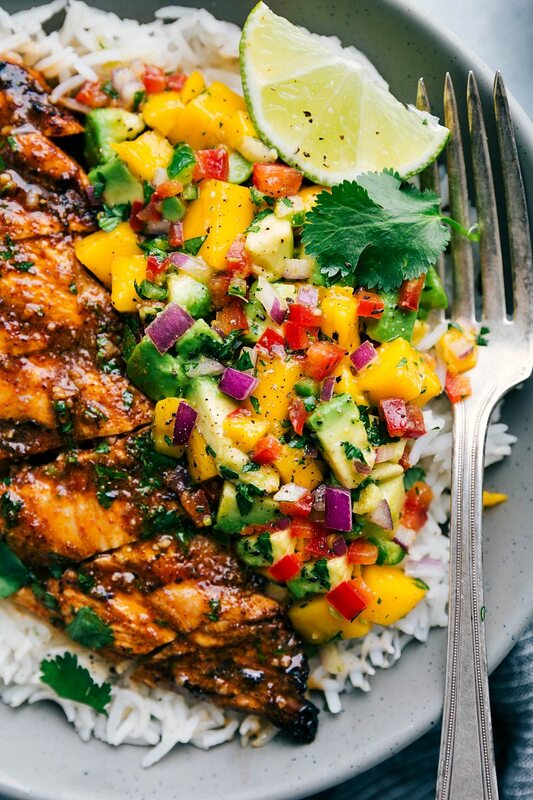 This cilantro lime chicken also pairs really well with my mango salsa which I always make as a side when I make this dish. I’d recommend giving it a shot! Whisk together all of the marinade ingredients: remove about 1/2 cup of the marinade (we’ll use it later). Prep chicken: you want to pound chicken breasts to an even thickness so they’ll cook evenly later on. This is best accomplished by a meat mallet. Marinate: place the chicken in marinade and chill in the fridge for at least 30 minutes and up to 24 hours. Baste: as you cook the chicken, brushing it occasionally with the reserved marinade mix. Make sure to slice the chicken in half, or pound them into an even thickness before marinating. This allows the chicken to soak up more flavor from the marinade (improves taste), and the even thickness will allow them to cook evenly. If grilling, generously oil your grill grates. I do this by rolling up a few paper towels, drenching them in oil (I use canola), and using tongs, rub the drenched paper towels along the grill grates. Doing this will contribute to a beautiful sear, and ensure the chicken doesn’t stick to the grates. If grilling, fully preheat your grill. I know it’s hard to wait, but adding meat to a fully preheated grill will sear the surface of the meat which will give you a juicier chicken. It also allows the chicken to get a great char. As the chicken is cooking, brush the reserved marinade on the chicken. Doing this will further enhance the flavor. Once it’s finished, let the cooked chicken rest, tented with foil, for 5-10 minutes before cutting in! Mango avocado salsa: The salsa has an outstanding texture that pairs perfectly with the cilantro lime chicken. The sweetness of the mango and the orange juice perfectly balances the tang of all the cilantro and lime from the chicken marinade. Check out the mango salsa recipe or find it in the recipe card below as well. Cilantro Lime Chicken and Rice: Serve this cilantro lime chicken over cilantro lime quinoa or rice for an amazing meal. I’ve included my favorite recipe for cilantro lime rice (or quinoa) in the recipe notes section. Cilantro Lime Chicken Taco Salad: To convert this recipe into a salad, finely chop some romaine lettuce, add (cooled) chopped cilantro lime chicken, your favorite veggies (such as cherry tomatoes, chopped bell peppers, cucumber, etc.) and the dressing from this quinoa black bean salad. Baked Cilantro Lime Chicken:Preheat oven to 425 degrees F. Place chicken on a baking sheet lined with parchment paper. Bake for approximately 18 minutes, flipping the chicken halfway. Remove from the oven, and loosely cover sheet pan with foil. Let the chicken rest for 5-10 minutes. Sauteed Cilantro Lime Chicken: Heat 1 tablespoon oil in a sauté pan over medium-high heat. Add chicken breast and cook for 4-6 minutes per side until the chicken is cooked through and the juices run clear. As you saute the chicken, brush it generously with the reserved marinade. Transfer the chicken to a clean plate, and loosely cover with foil. Let the chicken rest for 5-10 minutes. This cilantro lime chicken is easy to make and packed with flavor! 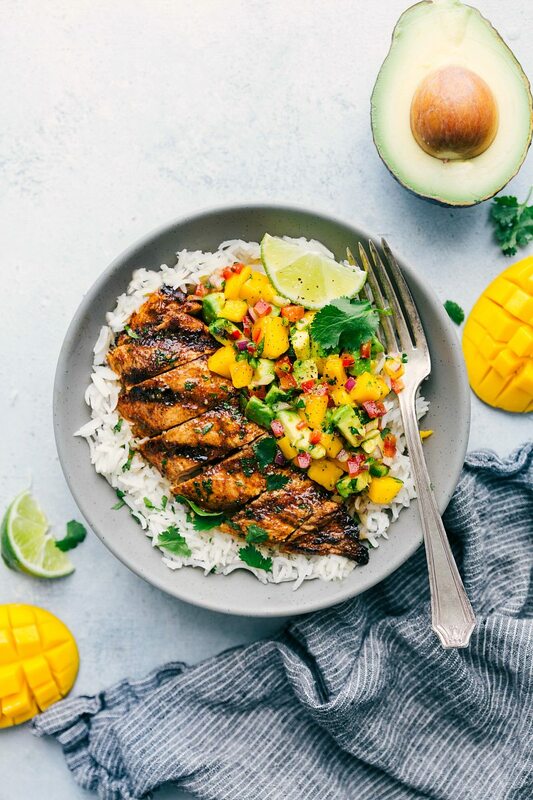 While the cilantro lime chicken can stand on its own, I've included accompanying recipes for a cilantro lime rice base and a delicious mango avocado salsa. This transforms this cilantro lime chicken into a tasty and healthy meal that is sure to be a hit. MARINADE: Whisk together all of the marinade ingredients: 3/4 cup orange juice, 1/2 cup olive oil, 1/3 cup lime juice, 1 teaspoon lime zest, honey, 1 teaspoon cumin, soy sauce, garlic, and 1/4 cup cilantro in a medium-sized bowl. Add salt and pepper to taste (I use about 1 teaspoon salt and 1/4 teaspoon pepper). Remove about 1/2 cup of marinade, and pour the rest into a large resealable bag. Trim the chicken of fat. Pound the breasts to even thickness or slice in half to get evenly sized breasts and place in the bag with the rest of the marinade. Place in the fridge for at least 30 minutes making sure to flip the bag halfway through the time it is in the fridge. I recommend marinating for 2-8 hours. COOK CHICKEN: The instructions below are to grill the chicken. To see other methods of cooking chicken, read right above this recipe card. Lightly oil the grill grate or grill ridges on a grill pan or add 1 tablespoon oil to a skillet and then place the marinated chicken on the grill. Discard leftover marinade. Grill for 10-12 minutes or until chicken juices run clear and internal temperature is at 165 degrees F. Flip the chicken halfway and brush it generously with the reserved 1/2 cup marinade. 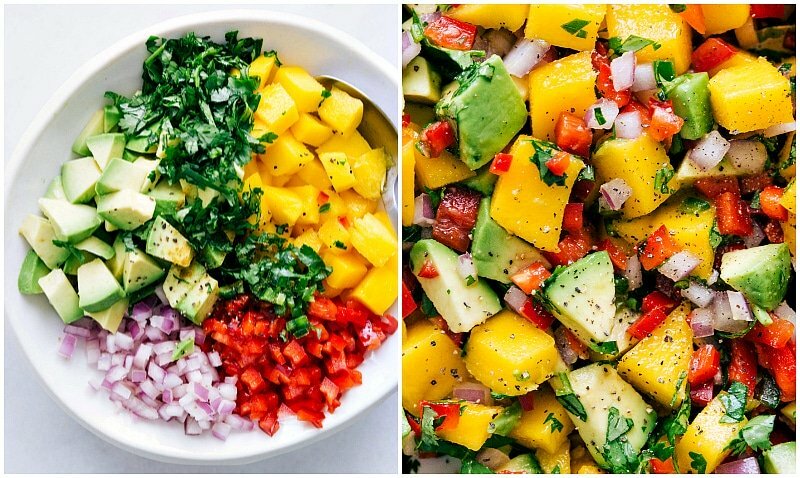 MANGO SALSA: Take the remaining 1 tablespoon orange juice, remaining 1 teaspoon olive oil, 2 tablespoons lime juice, remaining lime zest, and remaining 1/4 cup cilantro and toss together. Chop the mango and avocado into small bite-sized pieces. Add to the salsa along with the finely chopped red onion, red pepper, and jalapeno. Season the salsa to taste with pepper, salt, and remaining 1/4 teaspoon cumin. Toss together. ASSEMBLY: Serve grilled chicken over a bed of cilantro lime rice or quinoa (if desired -- see recipe notes) and add spoonfuls of the salsa to top. Enjoy immediately! This looks so good! I have an amazing chilli & lime salad dressing that I get here in the UK which would complement it brilliantly I think. This looks just like my kind of recipe! Cilantro is MY FAVORITE and this chicken looks divine! And why haven’t I tried that ranch dressing yet?!! Looks amazing! Any suggestions for replacing the Hidden Ranch here in Australia? Yes! I’d add the sauce in this recipe to this: https://www.chelseasmessyapron.com/one-pan-mexican-tortilla-chicken-veggies/ Enjoy! I think my friends would love these for our dinner tomorrow. Thank for sharing amazing recipe! Just WOW! I made this tonight and oh wow I’m definitely making this again! I didn’t have honey so I substituted brown sugar. This is a winner for sure. I’ll be checking out more of your recipes. I wound up making this in a pan instead of grilling, I cut the chicken into small pieces. Cooked them first, pulled and then put all the marinade in the pan with 2tblspns of butter to thicken, then added the chicken back in. IT WAS STILL DELICIOUS! Great recipe. Thank you. Do you have suggestions for doing this on the stove or in the oven?